For years I sewed infrequently, occasionally making a purse for a friend or a little something for Juniper once in a blue moon. And what I made was pretty awful. I never used patterns. My finished projects were best viewed from at least 10 feet away, and that's just not a great feeling to have about something you spent so many hours creating. I admit I was intimidated by patterns, and never even bothered looking through the hundreds of patterns available at the fabric store. I was sure I'd buy a pattern, spend a ton of time figuring it out and following it, and end up with a finished product that was ugly anyway. Then, a few months ago I downloaded the free skirt pattern from Oliver + S, and the skirt I made ended up looking nice, but even better, Juniper actually loved wearing it. The instructions were really simple, and I never would have figured out how to do it on my own. In fact, I like the design of the pajamas so much that I kind of want a pair of them myself, and I normally can't stand pajamas. Jim thinks they make the kids look like samurai in training, which of course is awesome (to him). 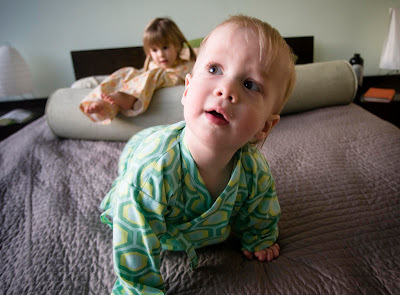 Oliver + S gave the pajama pattern a difficulty rating of beginner, which "assumes familiarity with a sewing machine; understanding of how to sew a seam, thread the machine, etc." The pattern was not easy to complete, but I didn't spend a lot of time swearing and I didn't shed a single tear. It was a well-written pattern, and worth the $16 price tag. 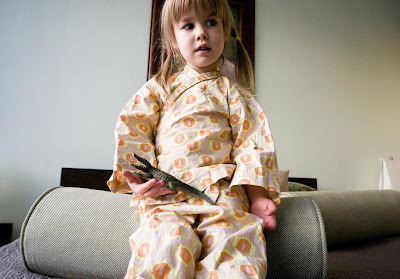 I'll probably make several more sets of these pajamas. About the price -- I've decided that if I'm going to sew something, I want to make something prettier or nicer or better designed than what I can buy at the store. I'm not sewing for thrift, because I am sure I could buy all of the things I make for less than the materials and my labor time. Instead, I want to enjoy the process of creating and I want to be completely satisfied with the result. I like Oliver + S, but your renditions are more adorable than I thought that pattern could be. Very nice. By the way, totally inspired by your first post (and that gorgeous fabric), this week I made a doll quilt...as practice for my first real quilt, god help me. Liana, I did the same thing - after reading Wood's post about doll quilts, I just gifted the two daughters of a friend doll quilts and pillows for their birthdays and they absolutely loved them.